Novus Piccolo GPS speed camera detector warns of fixed and mobile speed cameras, including Gatso, Truvelo, SPECS and red light cameras. The extremely compact Novus Piccolo then provides spoken voice alerts with speed limit announcement, whilst bright red LED's countdown from 500yards to the speed camera locations. Novus Piccolo has been designed to be plug and play and is pre-loaded with the latest speed camera database, ready to use. Novus Piccolo has been discontinued. Parts and spares are still available for your Novus Piccolo, to view them all click here. The brand new Novus Piccolo speed camera detector includes FREE lifetime speed camera database subscription. Novus Piccolo is 100% legal, state of the art GPS speed camera detector and includes spoken voice alerts of UK speed camera locations. Novus Piccolo is also supplied pre-loaded with a comprehensive speed camera database, and is ready to use straight from the box. Novus Piccolo provides warnings of fixed speed cameras, possible mobile sites, red light camera locations, accident black spots and congestion charging zones, making clear spoken voice announcements. Novus Piccolo will warn you to reduce your speed if you are approaching a speed cameras site above the speed limit. Novus Piccolo GPS speed camera alert system in addition to the voice alerts features a series of red LED's which countdown as the user approaches the speed camera location. On approach to a speed camera location Novus Piccolo first sounds a chime followed by a voice announcement such as 'Warning speed camera 500yards ahead - limit 30mph'. This will typically happen at 500yards from the speed cameras position, (in some cases a 500yards warning is not ideal because of the road layout). A second chime is heard at 200yards from the speed camera site, and if the vehicle is still over the speed limit, a continuous warning is heard 'Warning - reduce speed' until the vehicle speed drops to the speed limit, or the speed camera site has been passed. 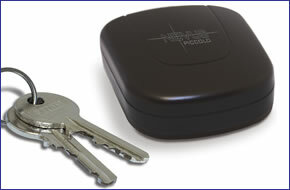 Novus Piccolo is easy to install, taking seconds to install and remove from your vehicle. The Novus Piccolo is installed on your dashboard via the supplied magnetic mount, then simply connect the in car power lead and your ready to use your Novus Piccolo. Novus Piccolo is preloaded with a comprehensive speed camera database. Updates are free to download and require a PC with USB port and Internet access. Want to add accessories to your Novus Piccolo? We sell a limited selection of genuine Novus parts and accessories. Answer: The Novus Piccolo along with the complete Novus range of speed camera detectors was discontinued by the manufacturer in 2012. We are therefore unable to supply you with a replacement Novus Piccolo. 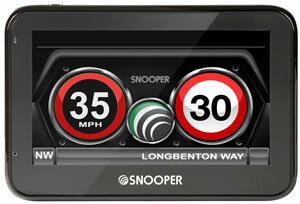 View our current and latest range of speed camera detectors. Question: Could you please advise how I can update my Novus Piccolo with the last update that is available please. I have owned this from new. Many thanks. Answer: We are not Novus and we do not handle any subscriptions. We are not the manufacturer. We do not own the Novus database. We have no control over the frequency of updates. We are ActiveGPS, one of many retailers that stocked Novus products. We understand that Novus GPS/AUTO is owned by DALTEC who can be contacted on 0208 515 7827. There is also a Novus website which used to list Novus Speed Camera Detectors www.novusauto.co.uk but it now lists dashboard cameras. You may wish to consider the Snooper MY-SPEED XL (pictured below) this detector is the only one currently available with a free database. Do you have a question about the Novus Piccolo? Submit your question via our contact page. ‣Power: 9-24 volt, cigarette lighter.